Each year the Hudson TMA offers free classes to individuals wanting to improve their skills and gain more confidence riding in Hudson County. They will also learn more about cycling safety and the rules of the road. Certified instructors provide a program which takes place both in the classroom as well as on the street. 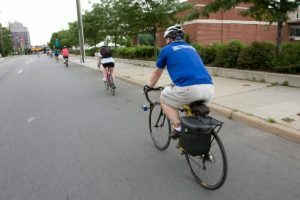 Cyclists at all levels receive a worthwhile education on bicycling in an urban area. For more information, email the TMA or call us at 201-324-6222.